If you do find yourself in a bar fight, call on a friend that might just even the odds in your favor. But this dilemma is less about calling upon help so much as it is being the person picking the fight. For a cost of two, you get to figuratively pick a fight against two personnel of your choice on the planet by stopping them. If your opponent has a friend in his hand, he can bring them in to replace some of the attributes and/or skills that were stopped. However, if your opponent doesn't have a friend in hand, then he is out of luck; or, if you've stopped mission skills and there are no replacements in hand, then he could be out of luck in that respect also. There are a lot of variables in this dilemma, but there are ways that you can control or at least mitigate the risk. You can use this dilemma if your opponent has no cards in hand. You could play Romulan and use Far-Seeing Eyes to remove mission skills, then play this when you know there are no more of that skill left in the deck. You could take that farther and use At an Impasse with discard mechanisms to restrict your opponent's hand and/or drawing ability. You could use all the cards that allow you to look at an opponent's hand to know what they have, then figure that into how many they drew/played that turn to know your chances. In the end, though, this dilemma is high-risk/high-reward. You get two choice stops, however they could get a suitable replacement, or they could cheat-in the skills/attributes on other personnel. They can even prevent one or both of the stops and totally hose your plan. This dilemma is great for sealed deck or draft, but is really only "so-so" for constructed play. 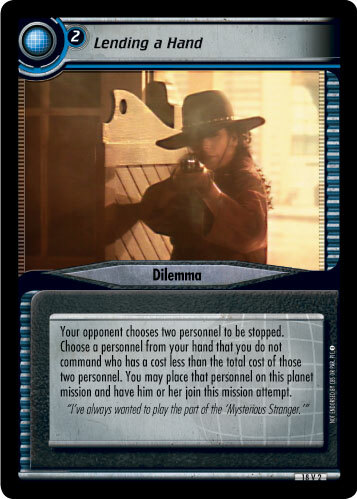 If you can find a way to make this dilemma more reliable, then good for you, but it appears to me that this card isn't going to be the heavy-hitter you want it to be. Still, though, it does work some of the time and it's got a cool picture of the counselor on it. Whoops, I mean "Durango! ".